Richard Giglio is an accomplished trial attorney who has spent his career fighting for those in need. Mr. Giglio focuses his practice in injury cases, ranging from automobile negligence, medical malpractice, slip & fall accidents, and negligent security. After earning his B.A. 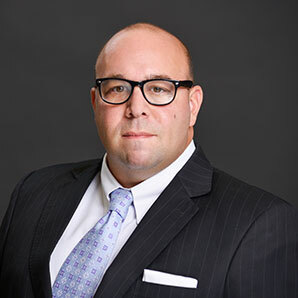 from the College of William and Mary, and his law degree from Villanova University School of Law, Mr. Giglio spent his first several years of practice serving the citizens of Florida as an Assistant State Attorney in Hillsborough County Florida where he prosecuted more than 100 cases at trial. Following his storied tenure in the Felony Division of the State Attorney’s Office, Mr. Giglio sought to put his skills to work in the civil arena and joined Maney & Gordon, P.A. In order to best assist the injured, Mr. Giglio spent a brief portion of his career working on behalf of large insurance companies, learning the methods they utilize to deny the injured and wronged the benefits to which they are lawfully entitled. Mr. Giglio is an active trial attorney whose cases have been the subject of media attention including week-long gavel-to-gavel coverage on CourtTV/InSession. Mr. Giglio is rated AV Preeminent® by Martindale-Hubbell, the highest rating an attorney can achieve in the areas of legal ability and ethical standards. Mr. Giglio is involved in a variety of charitable and civic activities in the Tampa Bay area and his hometown of St. Petersburg.